A big-hearted team member at Specsavers Cheltenham has launched a fundraising campaign to help buy a defibrillator for the local community. 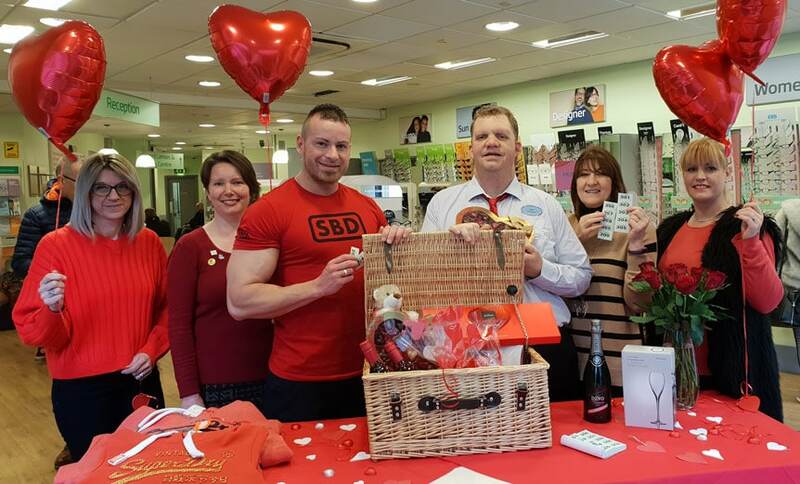 Lab assistant James Tombs, 36, launched the ‘Hampers for Hearts’ campaign to help raise £1,800 to buy the life-saving device, to be installed outside the store on the spa town’s High Street. To date, James has raised around £700 by selling raffle tickets for his first hamper, containing prizes donated by local businesses and customers. The draw will take place on Valentine’s Day. He came up with the idea of raising money for a defibrillator after doing a first aid course via the store. He then personally visited every shop on the High Street collecting donations for the hamper. James joined the Cheltenham store in 2017 as part of the GEM (Going the Extra Mile) Project – a Gloucestershire scheme that helps people dealing with circumstances that may make it hard for them to find work. James, who has a learning disability, works in the lab. He was unable to read or write when he joined the store, but has made incredible progress. Emily Ashman, the store’s PR coordinator, liaised with the GEM Project to find a group for James to help him learn to read. For the past six months he has been going to the local library once a week for a reading programme, and can now read words of up to five letters. Currently four of the 45-strong team are from the GEM Project. Melanie says that initially some effort was required from the whole team in order to support their new colleagues, but the team were quick to get on board. The long term benefits to the store have been incredible, she says. ‘It’s been revolutionary, the difference it’s made to us, embracing disability and understanding that everyone has different strengths. The ethos of the store is totally different now – it’s a caring, nurturing environment with a great sense of teamship. ‘James is always upbeat, always really pleased to come to work, always looking for what can he do to help. And he only ever talks positively, so you can’t help but respond in the same way. Having someone like James around, striving to work and do well, has shown the team how valuable it is to everybody to have a good job. He is a massive asset. Picture shows (from left to right): Melanie Brackstone (store director), Emily Ashman (PR coordinator), Shaun Millin (optical consultant), James Tombs (lab assistant), Sue Guilding (GEM Project), and Caitlin Maxwell (optical consultant).